ZBB Energy Corporation (Amex: ZBB) today announced that Mr. Bill Mundell has accepted the position as Chairman of the Board of Directors, taking over from Australian-based Mr. Richard Payne, who will continue to serve as a non-executive Director. Mr. Mundell joined the Board of ZBB following completion of the Company’s IPO in mid 2007 and his appointment as Chairman is a further move to strengthen the management of operations from the United States. ZBB Energy Corporation provides clean energy storage solutions based on proprietary zinc rechargeable energy storage technology that addresses requirements in multiple markets such as alternative energy applications, large electrical utilities and green residential and commercial architecture. A developer and manufacturer of its modular, transportable and environmentally friendly Zinc Energy Storage Solutions (“ZESS”), ZBB was founded in 1981 as an R&D company and is headquartered in Wisconsin with offices located in Perth, Australia. On August 16 2010, President Barack Obama visits ZBB Energy Corporation to tour the company and learn more about the development of intelligent, renewable energy platforms. 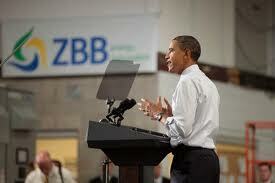 The visit to ZBB was part of the President’s effort to highlight his clean energy policies. Speaking to a group of ZBB employees and guests, the President praised the company for leading the way in clean energy manufacturing and helping the United States economy to grow.